Mailster has a dedicate list of your subscribers so your WordPress users are by default not connected to your Mailster subscriber base. There are several ways to connect them and work with segmentation on the user data. If one of your subscribers has the same email address as one of your WordPress users Mailster will connect them automatically. You’ll find the WordPress logo inside the User Avatar. You can see it on the subscribers overview as well on the detail view of you subscriber. Mailster will always connect the user if the email address matches. To get your existing users into the Mailster database you have to import them via the Manage Subscribers page. Go to Newsletter => Manage Subscribers and choose the user roles you like to import. You can also define which meta values you like to have as custom fields. This is important for segmentation. Follow the instruction on the screen until your users are imported. To create a subscriber from a single user you can find the Create Mailster Subscriber button on the profile page of a certain user. Mailster will automatically create your first subscriber based on your current WordPress profile. By default Mailster will ignore new WordPress users to your site but you can automatically add them to you subscribers. If you have enabled registration on you site you can enable this option so Mailster will automatically add a new subscribers if a new user signs up to your site. Mailster can sign up you commenters to your lists with this option. Many third party plugins can add WordPress users. If you choose this option Mailster will listen to the user_register hook and create a new subscriber. 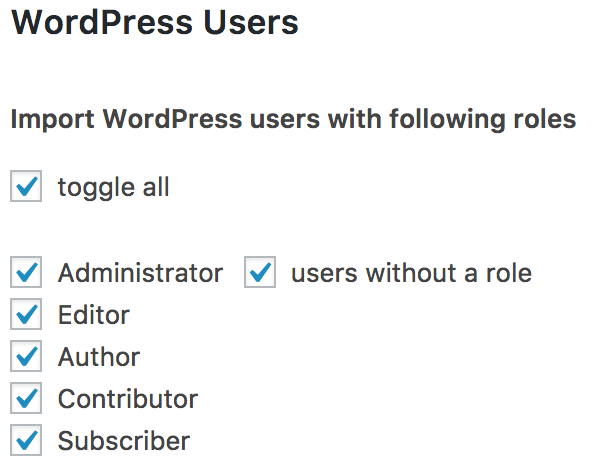 If you like to keep your user data in sync you have to enable the option on the settings page (Newsletter => Settings => WordPress Users). Define the fields which you would like to connect. Every time the subscriber or the user gets updated these fields will stay the same. This only works for existing Subscribers!